We are located in Peoria, Oregon on the Willamette River. Our spacious (600sq ft) quarters with it's own entrance is privately located on the North end of our 100 year old granary residence. We offer beautiful grounds to stroll, the river to enjoy, and the peacefulness of country living. Here at the Old River Granary there are plenty of opportunities to play, rest, and relax. Take a walk down the river, shoot a game of pool, or just relax in the hammock by the river. Step out on the private balcony and see both sunrise over the Cascade mountains and sunset over the coast range. Views vary with the seasons. Corvallis, home of Oregon State University, is located just 10 minutes away and offers a friendly home town atmosphere with a variety of stores, river front restaurants and a wonderful farmers market (Apr-Nov) with fresh local produce, fruits, flowers, honey, jams and more. The Old Granary is truly a little piece of paradise, away from the stress of everyday life. We think your stay at the River Guest Quarters will be an experience to remember...and we welcome you! Moved from Laguna Beach to escape the density of California and feel so blessed to have purchased this historic 100 year old granary on the 10th largest river in the United States. Country living is a dream come true. We fell in love with this unique piece of property, the old barn, the Douglas fir wood floors the wood beams and ceilings, the incredible river view the country living that provides serene and peaceful surroundings. Watching the eagles dive into the water and come up with a fish, all the species of birds right outside our windows. Relaxing in our hammock overlooking the river. Remodeling and watching all the potential this property had was an amazing journey. We fall more in love with it with each passing day and remain grateful for our lives here at the Old Granary. 10 minutes from Corvallis home of Oregon State Beavers. Wonderful riverfront restaurants, lovely boutiques, great brew pubs, dozen of wineries within 20 minutes of downtown. Easy access to the river. Can take a 1 mile out and back trek along the river. Some on the rocks some on the edge of the water so bring your water shoes. Separate billard room located in barn with propane fireplace and 36' TV with satellite dish for sports and music. Welcome to use large deck located off back of main house with big wooden table that over looks the river. Great for entertaining outdoors (weather permitted). This rental was exactly what we hoped for and needed. It had all the comforts of home in a beautiful setting with lovely gardens, plants, books, and a mesmerizing view of the river. It was a great and quiet place for us to enjoy a relaxing weekend with our OSU daughter! The bed and couches were so comfortable, too! Thanks so much to Gregg and Kathy for providing this beautiful rental and their nice Oregon hospitality. 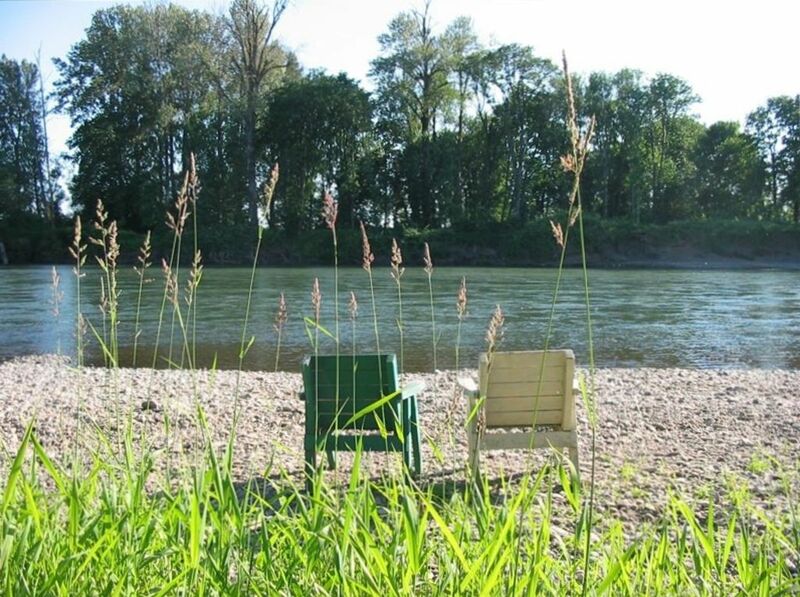 We are so happy to be able to share our property here on the river, we never get tired of hearing that our guests find our river apartment a comfortable, homey and peaceful place to spend their time away from home. We know there are many places to stay in Corvallis and we feel blessed when travelers choose to stay here in the country as opposed to the city. Corvallis is a sweet college town only 10 minutes south of us, staying at the Riverhaus gives travelers a chance to experience both country and city amenities. Thank you to our prior guests for your kind review and we hope to see you again. GO BEAVS! Such a peaceful piece of paradise. Well stocked, with lots of windows. This is a very cozy, relaxing unit; a perfect place to unwind. Easy drive to Corvallis and Newport. We were blessed with beautiful fall weather so it was nice to take advantage of all the Willamette Valley has to offer. There is an easy river walk in downtown Corvallis near OSU, great restaurants, plus many wineries. Kathy and her husband were so accommodating it was a breath of fresh air. There were some minor issues but they made sure we were comfortable over all. I was able to relax do my homework at night and able to be down close to the OSU campus where my horse was having his surgery. Both my boyfriend and my self didn't want to get out of the nice warm soft bed. Would love to stay there again and know we can. for the care, comfort, and wellbeing of their many, many appreciative guests! There is an abundance of RIVER, Peace and quiet, windows, houseplants and lovely landscaping, and books—lots and lots of books! The gentle—neverending—flow of the river, restoreth one’s soul! We shall return, as often as possible! Thank you for the amazing review! We always feel so blessed when our guests enjoy the Riverhaus as much as we do. We pride ourselves on offering each guest privacy, cleanliness, peace and quiet and the run of our property. We look forward to seeing you in the future. Go Beavs! Artistically and tastefully decorated ~800 sq ft suite overlooking the beautiful Williamette River in old remodeled granary building. Quiet and secluded and very romantic. All modern kitchen convinces. Private bedroom suite. Thank you for the wonderful review we really enjoyed seeing you both again and are very pleased that you chose the Riverhaus for your visit this year with your family in Corvallis. Hope to see you again soon! Could have had more tome to enjoy the property. Easy access to walking, jogging and bicycling on flat country roads surrounded by acres of farmland. Wine tours throughout the Willamette Valley are a must. Steps from front door enjoy boating, kayaking, swimming, fishing, river floats or just relax and watch the river flow.